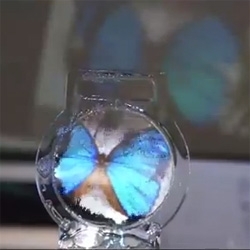 A Colloid Display, this sonically controlled soap bubble could be the world's thinnest transparent display. Created by Yoichi Ochiai, Alexis Oyama and Keisuke Toyoshima. Find out more about the project here.